Hear up to seven discrete channels of audio data plus the low-frequency effects (LFE) channel. Dolby 7.1 surround sound enhances the game. Adjust the volume or mute in seconds. Audio controls are located on the 2.3-meter cable, so they are always within reach. Hear the game the way the developer intended. Dolby 7.1 sound output appears to surround you as if it’s coming from all possible directions. The ear cup pivots for a personalized fit, and rotates 90 degrees to lay flat. The lay-flat design makes them easier to transport and more comfortable when resting around the neck. G430 ear pads are covered with sports-performance cloth for a soft-touch comfort, even after hours of use. Slip off the cloth cover to wash, and keep the headset in top shape. Stay focused on the game, not your headset. 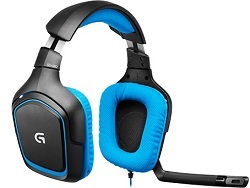 G430 ear cups are designed to be slimmer and lighter, without skimping on audio quality. You might forget you’re wearing them. Be heard loud and clear without the distraction of background noise. Adjust the mic to pick up only your voice.